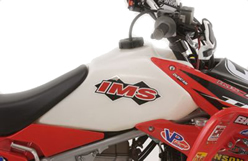 Designed to enhance the appearance of your ATV, yet provide greater riding distance per tank. Larger capacity than stock, yet very slim and sleek. A must have for endurance racing or trail riding, save minutes by not having to refuel. These tanks are made with POLY-ETHELENE CROSSLINK for extra strength and durability. 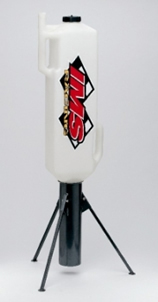 The IMS dry break system enables the racer to fill 4 gallons in 7 seconds to minimize the duration of pit stops. This component works in conjuction with the dry break probe in order to fill the receiver on the IMS dry break tank. The dumpcan is available in 4 or 11 gallons, however the 4 gallon requires the IMS dumpcan stand. 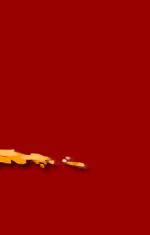 Prevent unwanted dirt and water getting into your fuel system. Convert your existing IMS dry break tank into a screw cap tank with this IMS screw cap adapter. It is made of billet aluminum and comes with a black non-vented plastic gas cap. 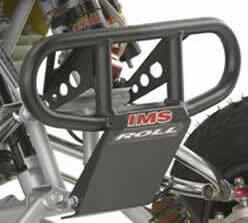 The IMS dry break system enables the racer to fill 4 gallons in 7 seconds to minimize the duration of pit stops. With its solid bottom, this component offers an environmentally friendly way to hold your dumpcan in place, as well as protect your probe from the elements. Come in a beautiful black gloss finish, built tough to last the test of time.